The following is a selection of just a few of the treasures you should see on your visit to Lichfield Cathedral. 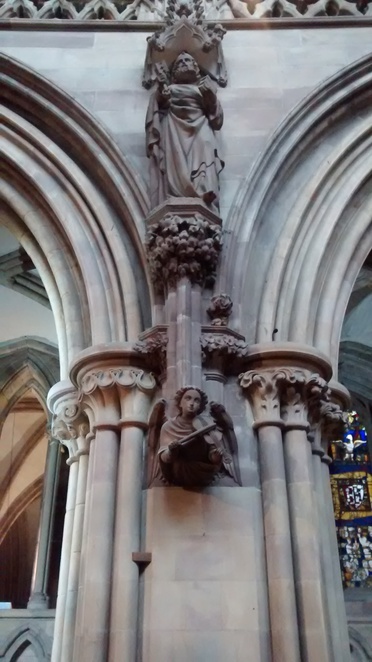 The current façade is the result of a great restoration movement in the late nineteenth century, which sought to restore the statues to their medieval condition. The statues include St Chad, Norman and Saxon kings, apostles, prophets, angels, biblical characters, and Christ. Three medieval wall paintings were uncovered during the extensive restoration work of the nineteenth and twentieth centuries. Other paintings were likely destroyed during the Reformation and Civil War. A modern floor tile and a religious icon now mark the site of the original shrine, which would have been situated at the entrance to the original chapel. 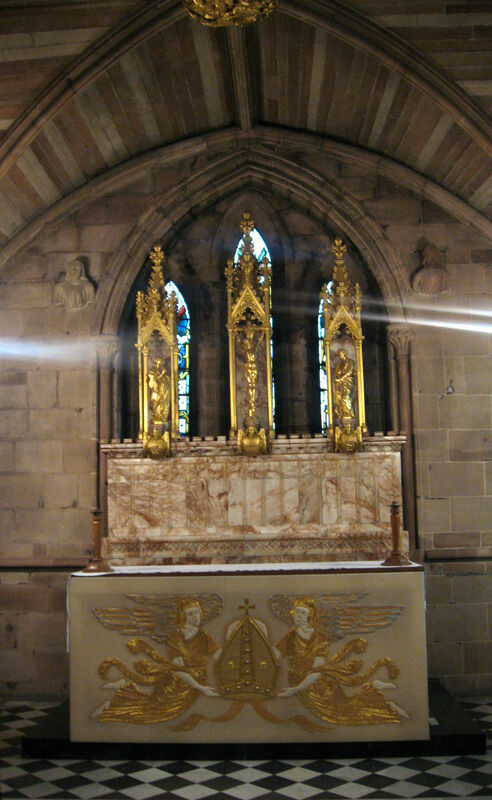 The site is now contained in the Lady Chapel, which was added to the cathedral in the fourteenth century. Stairs located adjacent to the Quire and next to the South Transept lead to St Chad's Head Chapel, which once housed the saint's skull. The Blessed Sacrament is now kept there. 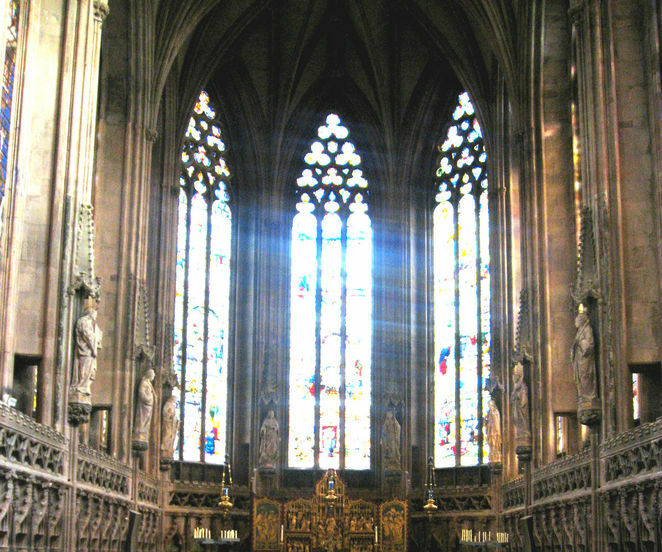 The chapel also offers an uplifted view of the cathedral over the Quire and across to the Chapter House entrance. 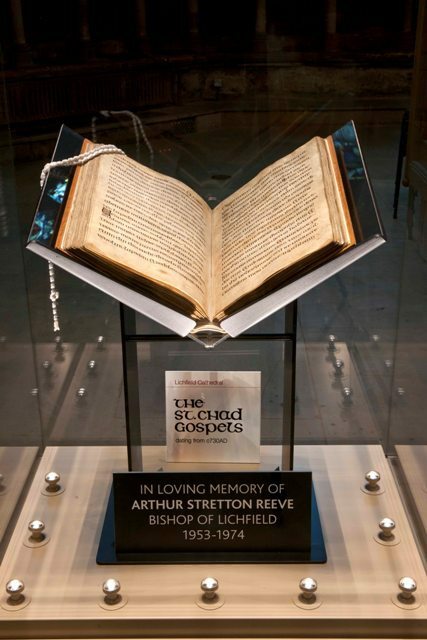 The illuminated St Chad Gospels are on display in the Chapter House. It is one of the oldest books in England (730 AD) and it is still used for present day services. See here for more information. 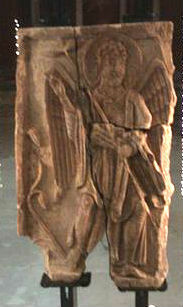 The Lichfield Angel is also on display in the Chapter House. It has been dated to the late eighth century and was probably part of the original shrine to St Chad. 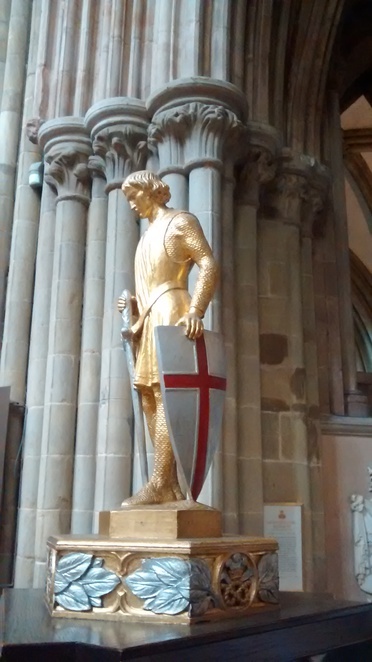 The South Transept contains several memorials, including a statue of St George honouring the fallen, Books of Remembrance for the two World Wars, and rows of flags surrounded by stunning stained glass created by the Victorian designer, Charles Eamer Kempe. 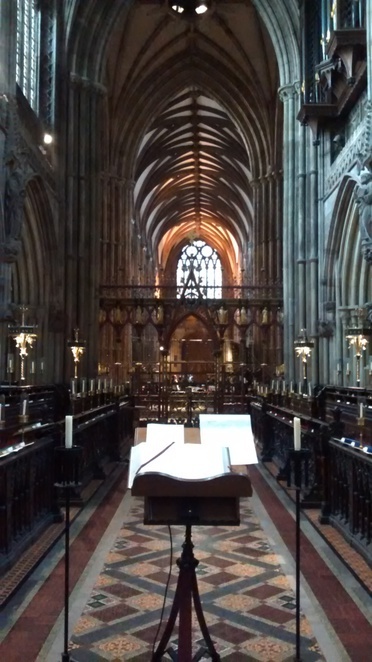 The Quire, with its elaborate screen and High Altar, is the result of Victorian restoration after it sustained damage during the three sieges of the Civil War. The Screen is a particularly stunning artistic achievement by Francis Skidmore in honour of St Chad. 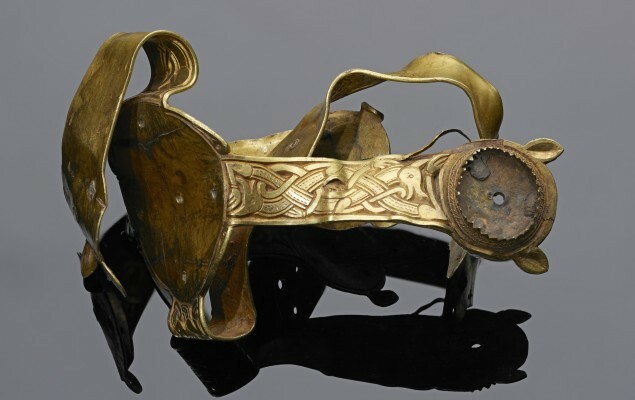 The Staffordshire Hoard is the largest collection of Anglo-Saxon gold ever found to date. Select items from the hoard are currently on display in a free exhibition in the Chapter House. 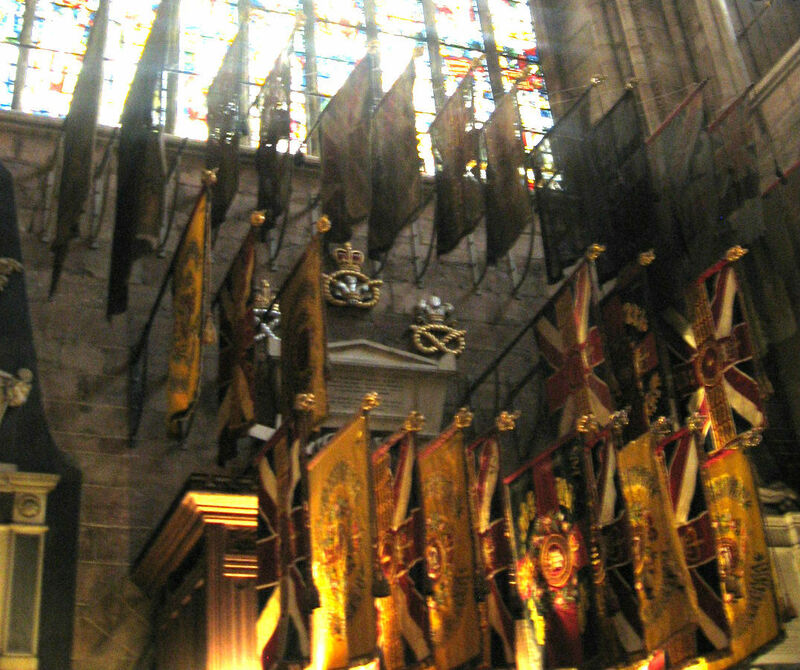 *Quotes and historical information are from the official website and multiple visits to the cathedral. Lovely photos, but can I just point out that Lichfield is a city - hence the cathedral - and not a 'quiet village'.